Today’s Final Jeopardy answer (in the category Explorers) and game statistics for the Monday, July 16, 2018 game between Rebecca Smith, Niraj Dhami, and 2-day champion Michelle Cabral. Today’s Final Jeopardy answer (in the category Modern Language) and game statistics for the Friday, July 13, 2018 game between Bryan Rucker, Vincent Valenzuela, and 1-day champion Michelle Cabral. 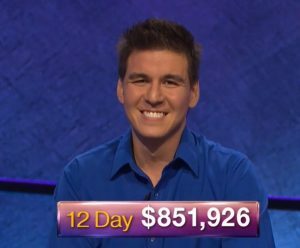 Today’s Final Jeopardy answer (in the category 1970s Bestsellers) and game statistics for the Thursday, July 12, 2018 game between Johanna Schaufeld, Michelle Cabral, and 3-day champion Wes Hazard.